The New Badge of Honor ... given to those who made it to the Top of Onyx Summit this year!! Photos from Onyx Summit at 8,443 Feet!!! It was a beautiful day at Onyx Summit ... with temperatures at about 65 degrees!! Blue sky. Clean, crisp mountain air. Perfect!! It was great fun to share the joy of these cyclists arrving at THE TOP!! These 90 photos show how great of a time it was at the Onyx Summit Party this year!! At 12:40, Marc Patton and Mark Knudsen arrived. Last year, Marc set a Course Record with a time of 5:16. This year, they both started at 7:08 for an elapsed time of 5:32 ... and arrived at the top together!! It was great to be able to be there with my camera before these guys arrived. Last year, Marc was way ahead of the camera and our Rest Stops he was going so fast!! The first Woman, Annelie Chapman, arrived at 12:52!! She started with Marc Patton and Mark Knudsen and only lost 12 minutes on them for the entire distance of 74 Miles and over 10,500 Feet of Climbing!! Annelie really smoked the course: her elapsed time was 5:44!! How good was Annelie's ride? AWESOME to say the least ... it was only last year when we had the first Woman ever to even make it to the top at Onyx Summit. In 2000, Audry Adler had a great ride and was the fastest Solo Woman with a time of 7:33. Laura Needels teamed up with Michael Kantner on their tandem last year with a time of 7:13. Annelie really took the bar WAY UP for the Women this year by beating Audry's time from last year by a whopping 1:49 .. One Hour and 49 Minutes!!! Congratulations to Annelie!! We were amazed at the number of 4 Pass Finishers this year ... last year we had a total of 23 riders who made it to the top at Onyx Summit. This year we had 36 riders who made it to the top at Onyx Summit!! Congratulations to everyone who made it!! 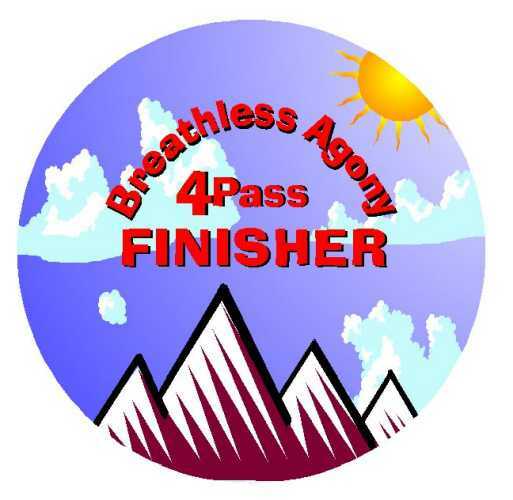 Each person arriving at the top was given a Badge of Honor: an Official Breathless Agony 4 Pass Finisher's Refrigerator Magnet shown above!! Way cool!! A HUGE THANKS to Wendy Reynolds and her dog Maggie ... it's not easy driving a loaded van up on these curvey roads!! Wendy was in charge of Rest Stop 2 at the Mill Creek Ranger Station and Rest Stop 4 at Onyx Summit. We'd like to really thank Marty Breen who worked Rest Stop 1 in Beaumont and this Rest Stop 3 in Angelus Oaks. Marty just did a great job ... and is already looking forward to Breathless Agony 2002!! Marty flew up to Angelus Oaks in 1999 ... he was the First of the 3 Pass Finishers and a real leader to all of us youngsters as he was 56 years old then!! We'd also like to really thank Jim Carter who helped Marty at Rest Stop 1 and 3 ... and drove his SUV as a SAG vehicle on the road. Jim is celebrating his 70th Birthday today, May 6, 2001 ... but you wouldn't know it: Jim road all 4 Passes to the top at Onyx Summit in 1999 and did 3 Passes in 2000. Then he came out and really gave us a big hand this year. Thanks, Jim: You're an inspiration to all of us youngsters!! We'd also like to really thank Diane Frymire who helped Marty at Rest Stop 3 in Angelus Oaks. We appreciate her giving us a hand as well.